Are you looking for an easy recipe for meatballs without breadcrumbs? You’ve found it! 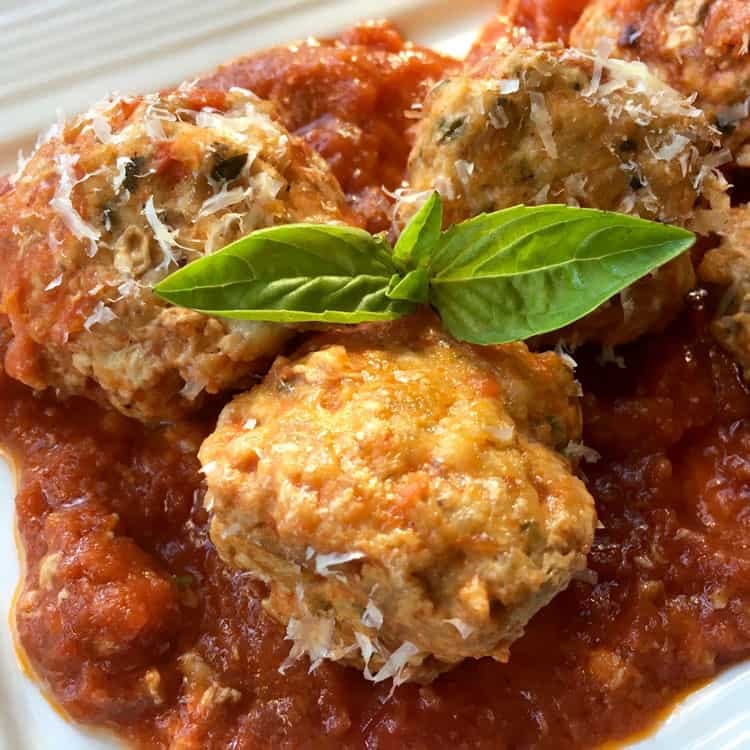 These Garlic-Parmesan Turkey Meatballs are free of breadcrumbs, making them perfect for gluten-free and low-carb diets. 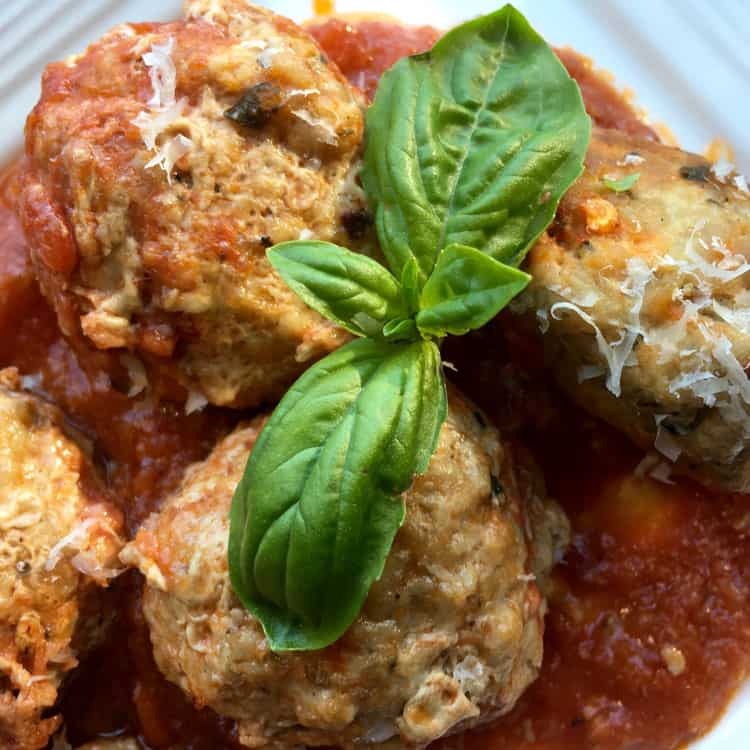 If you follow a gluten-free diet or low-carb diet (including the keto diet), it can be tough to find a meatball recipe that not only tastes good, but actually holds together. Luckily for you, you’ve found a great one! These Garlic-Parmesan Turkey Meatballs may be without breadcrumbs, but they certainly aren’t without flavor. Do you need breadcrumbs in meatballs? For that reason, the idea of not using breadcrumbs in meatballs can be a bit unnerving. No one wants to make a yummy meal with meatballs that are falling apart. Don’t worry — it is completely possible to make breadcrumbs without meatballs and they’ll hold together just as well as breadcrumbs with meatballs! What can you use instead of breadcrumbs in meatballs? 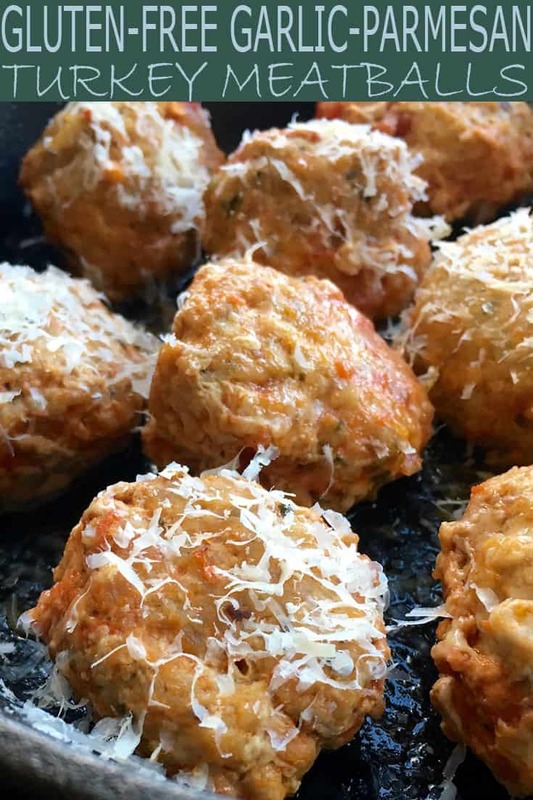 These Garlic-Parmesan Turkey Meatballs use the fourth option: cheese. Instead of breadcrumbs, you’ll use 1 1/2 cups grated Parmesan cheese! Not only are these meatballs without breadcrumbs gluten-free, but they’re also low in carbs. You’ll make six servings, and each serving contains only 5.1 grams of net carbs (carbs minus fiber). This makes them perfect for low-carb diets and acceptable for keto diets too. Tip #1: Bake the meatballs on their own before you add them to the tomato sauce. Doing so will help the meatballs hold their shape. Tip #2: These meatballs freeze well, so don’t be afraid to double or triple the recipe. These meatballs are so yummy that you’ll be happy to have an extra stash of them on hand! Simply pull them out of the freezer, reheat them, and serve them with your favorite gluten-free pasta (including “zoodles” like these butternut noodles). Tip #3: Invest in a silicone baking mat for easy clean-up. We’re huge fans of silicone baking mats in my household because they make clean-up a breeze! Tip #4: Serve these meatballs with fresh basil. It makes such a huge difference to the flavor! Easy Weeknight Keto Pizza with Pepperoni: This delicious pizza uses also uses Parmesan cheese, combined with cauliflower (yes, really! ), to create a mouthwatering gluten-free and low-carb pizza. Gluten Free Pasta Primavera Recipe with Sweet Potato and Zucchini Noodles: This recipe uses both zuchinni and sweet potato zoodles as the pasta base and is served with a variety of flavorful vegetables and Parmesan cheese. 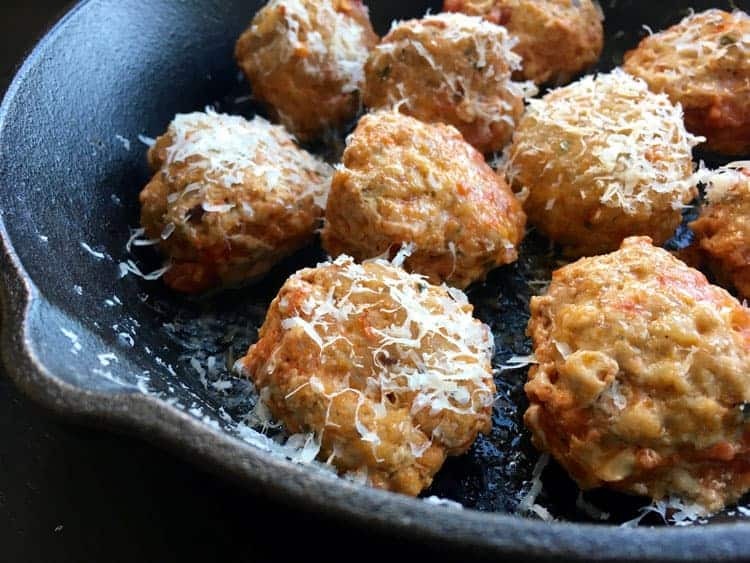 These Garlic-Parmesan Turkey Meatballs are free of breadcrumbs, making them perfect for gluten-free and low-carb diets. 2 cups sugar-free tomato sauce 2 pounds ground turkey breast 1 large (or 2 small) eggs 1 1/2 cup freshly grated Parmesan cheese 1 1/2 tablespoon fresh oregano leaves 3 tablespoons fresh basil leaves, chopped 3 tablespoons fresh parsley, chopped 3 cloves fresh garlic, finely minced 1 tablespoon onion salt 1/2 tablespoon crushed red pepper flakes Sea salt and black pepper, to taste Optional: Additional tomato sauce, Parmesan cheese, and fresh basil for serving. Preheat oven to 350°F. Take a rimmed baking sheet and line it with a Silpat baking mat or parchment paper. Set out a 9x13” glass baking dish and pour tomato sauce into it, making sure it is spread in a thin layer that covers the bottom. Set baking dish aside. To a large glass bowl, add the following ingredients: ground turkey, eggs, Parmesan cheese, oregano, basil, parsley, garlic, onion salt, and red pepper flakes. Season this mixture with salt and black pepper to taste. Use your hands to thoroughly combine the mixture. Then divide it into 24 equal-sized portions (18 if you prefer larger meatballs). If necessary, add more Parmesan cheese to bind the ingredients. Gently roll each portion into a ball, then place each meatball onto the prepared baking sheet. Leave room between each meatball. Place baking sheet into the pre-heated oven and bake for 15-20 minutes. Remove the baking sheet from the oven and transfer the meatballs to a prepared baking dish. If desired, drizzle with additional tomato sauce and Parmesan cheese. Place the baking dish in the oven for about 10 minutes, or until the meatballs and sauce are heated through. Remove from oven and serve immediately. If desired, add additional tomato sauce, Parmesan cheese, and fresh basil. i have tried this it it turn out really good than i expected, when we bite it, we get the a combined taste and its really yummy.